Dr Pankaj Talwar, HOD, Assisted Reproductive ,Technologies Centre, Army Hospital (R&R), Delhi visited the department on 11 Nov 2017 for Prabha Mehra Oration on 85th Foundation day of QMH on Fertility preservation in cancer patients. Dr Hena Tiwari (associate Professor) Department of Obstetrics and gynaecology Coulter St Amarillo Texas visited the department and delivered a lecture on Hypertensive disorders in Pregnancy. Dr Kamlesh Verma from University of Lubbock delivered a talk on Hypothyroidism in pregnancy and postpartum care and contraception. CME was also attended by 12 medical students from University of Lubbock, Texas, US. Dr Surendra Verma, Pediatric endocrinologist from University of Lubbock also stressed on the importance of treating iodine deficiency and Hypothyroidism in pregnancy to prevent hypothyroidism in neonates. Dr Ajay Rane from Australia had PG teaching on Urogynecology, 10 May 2018. Dr Usha Maurya Kumar from Max Hospital, Delhi delivered a guest lecture on "Different methods of Haemostasis" on 4th August 2018. Major (Ex) Vishal Karad ,conducted SOFT skill workshop on 22september 2018. Ms Sussane Olejas visited the department on 28 September 2018 from World diabetic foundation. Dr Giriraj Chandak MD, PhD, CSIR Hyderabad gave Dr Prabha Mehra Oration on "fetal programming of non communicable disease: do we understand enough for it to be clinically beneficial" on 14th November 2018. 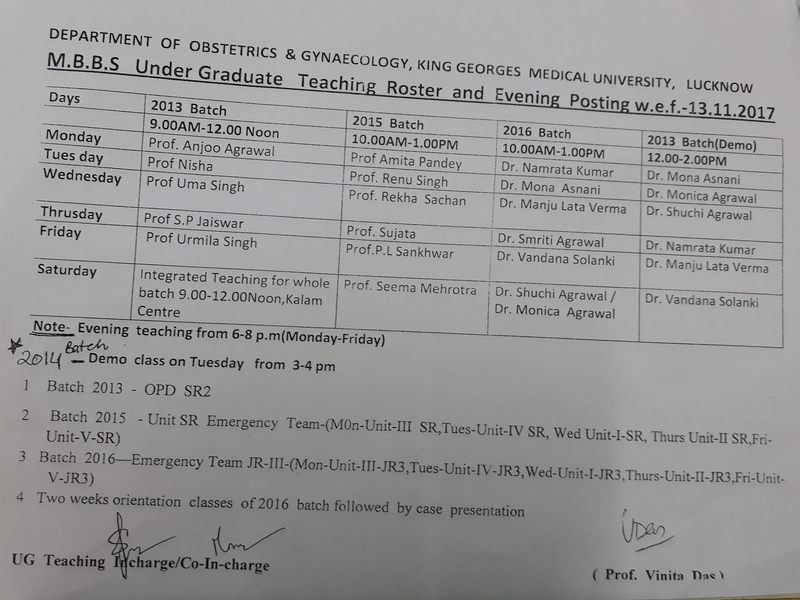 Department conducts undergraduate & postgraduate training programme for MBBS, DGO & MD (Obst. & Gynae.). There are 21 seats annually for the MD course and 9 for the DGO course. Operative Laparoscopy and Hysteroscopy Training. The department organized various public awareness programmes : breast feeding practices during breast feeding week, Swachhata Abhiyan ,new contraceptive use on world contraceptive day. 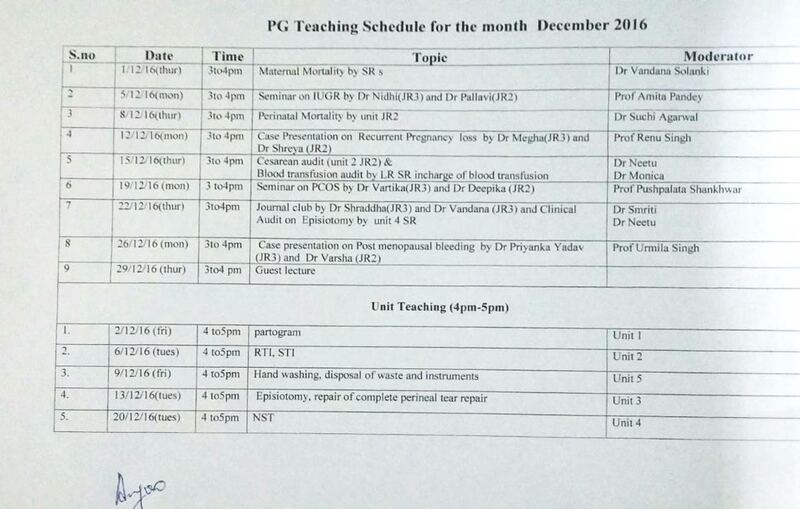 Department organizes twice a week PG Teaching. Vitamin D supplementation in pregnancy: regimens and long term effects on offspring. Clinical, immunohistochemical & sonological assessment of Endometerial receptivity in infertile human female. Stem Cells: in vitro tool to understand the mechanisms of pesticide induced developmental neurotoxicity. Vitamin D & Calcium Nutrition in Pregnancy- Evaluation of optimal supplementation dose of Vit. D during antenatal period Funded by CST. 2. Saksena Sona, Husain Nuzhat, Das Vinita, Pradhan Mandakani, Trivedi Richa, Srivastava Savita, Malik Gyanendra K., Rathore Ram K.S., Sarma Manoj, Pandey Chanda M., Gupta Rakesh K.. "Diffusion tensor imaging in the developing human cerebellum with Histologic correlation" Int. J. Devi Neuroscience 26 (2008) 705-711. 1. Akhter Ariz, Das Vinita, Pandey Amita, and Agarwal Suraksha "Effect of Glucocorticoids on Transcriptional Status of HLA-G in Human Trophoblast cells from full term Placenta" Int J Hum Genet,10(4): 223-229 (2010). To explain the role of Hedgehog signalling and the effect of promising ant proliferative agent. 1.Misra D, Singh R, Banerjee M. A simple and reliable method of obtaining fetal DNA from maternal circulation: its accuracy and sensitivity. Annals of Biological Research, 2011, 2(6):155-164. 1. GopalakrishnanV,Singh R, Pradeep Y, Kapoor D, Rani A K , Pradhan S,Bhatia E, Yadav S B.Evaluation of the prevalence of gestational diabetes mellitus in north Indians using International Association of Diabetes and Pregnancy Study Group (IADPSG) criteria. J Postgrad Med 2015;61:155-158. Module 1 - Clinical basic, Clinical data management, professionalism, ATCOM. Effective verbal and non verbal communication with patients and their family, as well as peer, senior & junior colleague and other hospital staff. History taking in Obst. & Gynae cases. Clinical examination of Obst. & Gynae. -nancy, low risk preoperative Gynae patient. Principal of wound healing, abdominal incisions, suturing. Common procedures-catheterization, dressing, stitch removal. Management of fluid, electrolyte , blood and blood products. Clinical note writing, discharge ticket writing, post operative note writing, data entry in departmental Records. Basics of clinical research- type of studies, research designs, audit, guidelines and Protocols. Sign, symptoms and d/d of pregnancy, confirmation of pregnancy.Various definition and terminology in Obstetrics and their significances (LMP, EDD, Parity, Gravida, Term, Preterm, Postterm, IUGR, LBW etc.). Examination of a pregnant woman and Antenatal care. Nutrition during pregnancy and Drugs in pregnancy. Importance of Genetics in Clinical Obstetrics. Management of 1st and 2nd stage of labour. 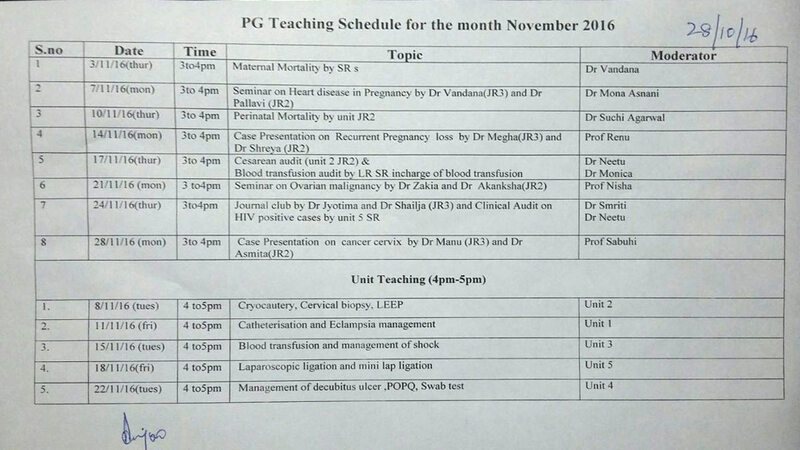 Physiology and management of 3rd stage of labour and prophylaxis of PPH. Neonatal resuscitation and management of new born . Normal puerperium and breast feeding. Puerperal sepsis and other Puerperal problems. PPH & Primary management of shock. Birth trauma and other congenital malformations, perinatal mortality. Asphyxia neonatorum, Icterus neonatorum and Neonatal Infections. Premature, dysmature and postmature babies. Threatened, inevitable, incomplete & missed abortions. Ectopic pregnancy types, pathophysiology & causes, management (medical, surgical & expectant). Recurrent abortions including incompetent OS. Family planning & contraception Overview, natural methods & barrier contraception. Hormonal contraception and emergency contraception. MTP Indications & MTP Act. MTP methods (Medical & Surgical). 1. Post Partum Contraception-counseling . Data entry and management of the department data in different registers and computers. Data reporting of delivery, still births , maternal deaths, infections disease, Blood transfusions. JSY form and form 16 of PCPNDT. Audit - clinical,mortality,(perinatal and maternal)Caesarean, near miss, journal club. High risk consent, breaking bad news, patient -Doctor relationship. 2 Resuturing of episiotomy & abdominal wound. 6 Operations for utero-vaginal prolapsed . Anatomy of female genital tract (External and Internal genitalia). Physiology of ovulation, fertilization and implantation. Development of female genital organs and their anomalies. Conception, implantation, development of placenta and establishment of fetomaternal circulation. Placenta and amniotic fluid structure, function and abnormalities. Fetal growth, development and fetal circulation. Anatomy of female pelvis and fetus. Physiology and mechanism of normal labour. Occipitoposterior position, face & brow presentation. Transverse Lie, cord prolapse and compound presentation. Abnormal pelvis and trial of Labour. Prolonged & obstructed labou, rupture uterus. caeserean steps & post operative care. Forceps delivery and ventouse delivery. Repair of cervical & vaginal tear. Bimanual uterine compression, aortic compression, uterine temponade. Preterm labor & P PROM . Post dated pregnancy and Induction of labor. Fetal distress & meconium stained liquor . Preg. with Thyroid disorder, Preg. with Obesity, Preg. with Sezire disorders, Preg. with renal disease . Detailed Obstractic ANC USG with Doppler. Normal & abnormal vaginal discharge, cervicitis & cervical ectopy. Reproductive and Sexually transmitted infections. Adolescence & its common problems. Primary amenorrhoea, secondary amenorrhoea and intersex. Abnormal uterine bleeding, diagnosis and management of AUB. 2. Malignant ovarian neoplasms . Workup of an infertile couple. Evidence based best practices in Obst & Gynae (e.g. episiotomy,anemia, partogram, antibiotics in labor). National and state level programs in MCH. (National Anemia Control Programme, RCH, NRHM and NUHM, Janani Suraksha Yojna, National Family Program). Public awareness programmes related to adolescent health, menopause,GDM, cancer screening & prevention, contraception, anaemia , breast feeding. Advanced Surgical skills, Ethical & Legal issues. Prolapse uterus examination , diagnosis and management. Management of decubitus ulcer before prolapse Surgery. Repair of complete perineal tear. Preconception and prenatal diagnosis & counseling.